The kilt as we all know is the most versatile of garments, and as such can be worn both formally and casually. You don't even need a special reason to wear a kilt, as you will see from the following pictures of men in kilts, they can be worn almost anywhere. 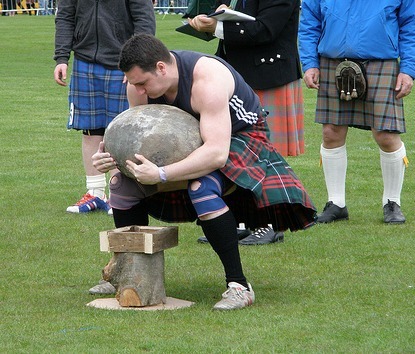 The first photo was taken at the 2010 Gourock Highland Games, and shows the athlete lifting the Kempock Stone, which incidentally weighs 160lbs. This is not something I would care to attempt! The next photo shows the same athlete celebrating, having successfully thrown the massive Kempock Stone clear over the caber. Notice the knee supports below his kilt, which I would presume are very important when lifting such huge weights. 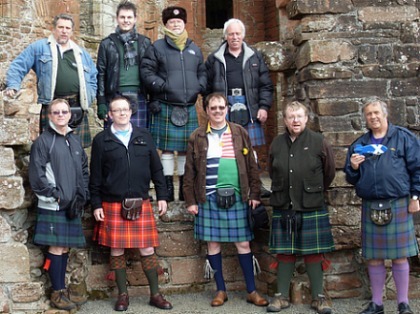 The next one amongst the pictures of men in kilts, shows a group of friends posing for the camera at Caerlaverock Castle. I particularly like this photo as it shows a wide variety of tartans being displayed. Standing on the far right of the picture is Alex Cunningham, Alex is the photographer who took the shot, and you will find many of his wonderful photos throughout my website. I would like to thank Alex, for being gracious enough to give me permission to use his work on my site. Now I find the next photo is a wonderful example of how versatile a kilt actually is. 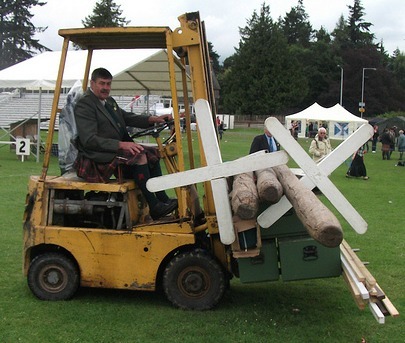 Have you ever seen a fork lift driver wearing a kilt? I know I hadn't until I saw this photo, by the way when my three year old son Conner wakes up tomorrow morning and sees it he will be delighted, you guessed it, he is a big fan of fork lifts. 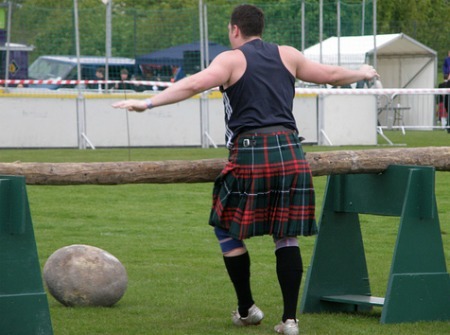 Up next is a wonderful shot of a Scottish athlete competing in the Harpenden Highland Gathering. 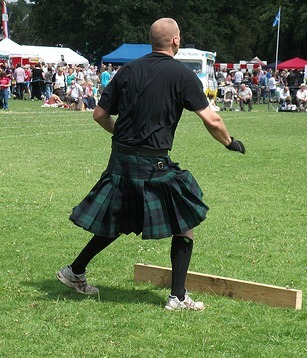 You can see how the pleats of the kilt are splayed, as he completes his spin, before throwing the hammer. Well what about this next one, once again if you needed proof that the kilt is the most versatile garment of all time, this is it. To be honest I don't know if the window cleaner is Scottish or not, but I would suspect that while he is working, he would be wearing underwear, for the sake of decency. 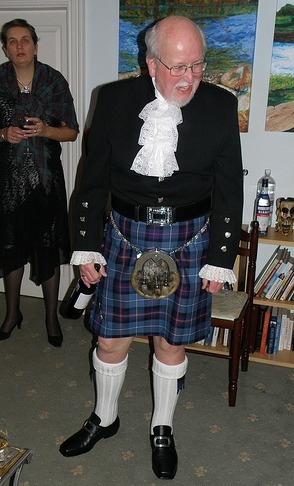 The next one shows the Laird of Ferintosh, in a semi-formal kilt outfit, getting ready to host a Burns Supper. I find this particular outfit stunning, the combination of the black kilt jacket with it's slit open sleeves, and the red and green Robertson tartan go wonderfully together. I need to find out where I can buy a kilt jacket like his! Once again this next shot shows a wonderful array of tartans being displayed, as these Scottish lads enjoy a night out in Dumfries, Scotland. And as you see the kilt being worn in a casual manner, looks just as good as it does when being worn formally. Notice too the wide array of accessories being worn with these different kilts. Here you see the kilt being worn in a formal manner, this is Highland Dress at its finest. The kilt is teamed with a lace jabot and doublet, with matching lace cuffs. The tartan, is that of the Royal Scottish Country Dance Society. 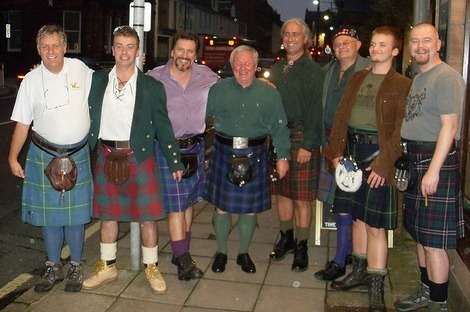 The Gentleman in the photo can be seen sporting various kilt outfits, on several different pages of this website. The following photo was taken outside the laird of Ferintosh's Guest House. 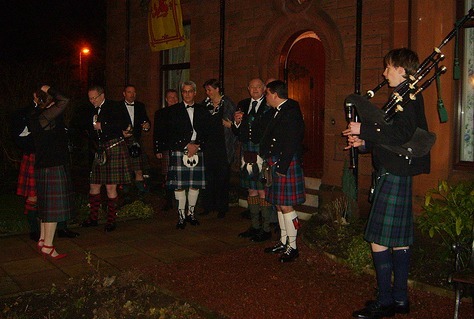 You can see the piper welcoming the Laird's guests to a Burns Supper, being held on Burns Day, January 26th 2008. You can see that some off the kilts are being worn in a semi-formal manner, with Argyle jackets, while others are dressed formally, with Prince Charlie jackets. The last photo for this page of pictures of men in kilts, shows three pipers awaiting their turn to perform. 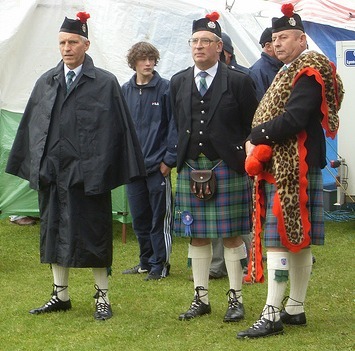 Taken at Hawick Highland Games, they are patiently waiting in the Scottish rain. As you can see one of them did come prepared for the weather, by wearing his Inverness cape, which is specifically designed to be worn over Highland Dress, he is staying dry. So as you can see from this page and many others on the website, the kilt is without doubt the most versatile garment imaginable. Nothing else can compare to its sense of style and elegance, which is why it can be seen being worn in many countries around the world. If you have any questions about any of the pictures of men in kilts featured on this page, or indeed anything to do with Highland Dress in general, drop me a line using the Contact Us page, and I will be happy to answer them for you.